The following advice has been provided by veterinary professionals at Village Vet. When it comes to your own food and dietary choices, chances are you watch what, and how much, you eat. But how much time do we give to consider our dogs’ diets? Sadly, dog obesity is an ongoing issue for vets and pet owners, especially as it can kickstart other health issues, it’s important to make sure that you’re feeding your dog the right amount of food. In this blog post we’ll answer some common questions dog owners ask vets about their dogs’ diets, including how much you should feed your pooch, what you need to know about your new puppy’s diet, and what human foods to avoid letting your dog eat. When it comes to food, there are two types are dogs; grazers and gobblers. Some dogs are happy to graze on their food throughout the day, but a gobbler scoffs down their food, and they always seem to want more. ‘Why is my dog always hungry?’ is a question vets often hear from dog owners, unfortunately there’s not a definitive answer that we can give. For most dogs who always seem to want more, it’s most likely because they simply enjoy eating. Just like us humans, eating sends positive signals to their brains. They want more, but this doesn’t mean that they need more food. If you’re feeding them the right daily amount, your dog shouldn’t need more, though there are some exceptions and your dog’s dietary need will differ depending on age and other factors. Sometimes an increased appetite can be the sign of an underlying health issue. If your dog’s appetite has suddenly increased, it is best to take them to see the vet, as it may be more than just a healthy appetite. The amount of food you should feed varies from dog to dog, so it’s important to determine the right amount for yours. Recommended feeding guidelines on food packets should only be used as a rough guide and these guidelines vary between different dog food brands. The amount of food which each dog requires depends a variety of things, including their age, health, lifestyle and the amount of exercise they’re regularly getting. For example, an athletic or extremely active dog will require more food, as opposed to a less active dog. Dogs tend to gain weight as they get older and as they become less active. If your dog is a senior or becoming less active for other reasons, (eg: injuries, health issues) the amount of food will need to be reduced to ensure they don’t start putting on weight; the older a dog gets, the more they’ll struggle to shed weight. Puppies tend to eat smaller portions, but more regularly throughout the day. Traditionally, dogs of 12 months and older require two meals a day, unless advised otherwise. The total daily amount should be divided between the two meals. Weighing your dog regularly is important and will help you see whether you are feeding them the right amount. This can be done at home, or alternatively book in for a free consultation with a veterinary nurse who can weigh them for you. You can check your dog’s poo to determine whether you are feeding them the right amount. The right amount of food should produce firm, dark brown stools. If it’s a little soft, this can be a sign of overfeeding. You can also perform a ‘profile’ and ‘touch’ test to determine if your dog is overweight. You shouldn’t be able to see your dog’s ribs, but if you can’t feel their ribs when you place your hands on either side of your dog’s chest, chances are your dog is overweight. A dog’s waistline should also be slightly narrower than their chest, tapering in before widening out at the hips. If your dog’s stomach or waistline is oval shaped, then it’s likely they’re carrying too much weight. In extreme cases, very obese dogs will have visible excess weight around their necks and hips. If your dog is overweight, the best approach is to gently increase the amount of exercise they get and to reduce their food intake. Don’t expect your dog to go from couch potato to a speedy, athletic pooch! You’ll need to build up the length of their walks little by little. If they have other health issues, or they are extremely obese they may need a specific food or other treatments and your vet is best placed to give you advice for this. Treats can be great for training your dog, however they can also interfere with their daily nutrition, particularly if you’re trying to help your dog shed some weight. If your dog eats dry food, you can take some of the kibble from their daily amount and use these as treats throughout the day. Your dog will think they are getting extra treats, but really they are not going over their daily recommended amount. What do I need to know about my puppy’s diet? When it comes to ensuring your puppy grows up strong and healthy, you’ll need to choose a diet that has everything they need to grow healthy bones, teeth, and more! Look for the specially formulated foods created by some of the major dog food brands and ask your vet what they’d recommend. It’s also a good idea to ask your puppy’s breeder what food they’ve been feeding them, as puppies will start to move from their mother’s milk to solid food at around the four week mark, roughly the period in their development when their teeth have appeared. Some breeders might even provide you with some samples of the type of food your puppy has been eating so far. Remember, if you want to change your dog’s diet at any stage of their lives, it’s a good idea to do this gradually. Introduce the new food little by little and don’t change too often as this can lead to confused dogs and upset stomachs. A lot of the food for puppies are based on dry foods. It’s important to have your vet monitor your puppy’s teeth development and they’ll be able to advise you. Once your dog is between six and nine months old, you should be able to move them onto an adult diet. Of course, this depends on the type of food and the breed of your dog, as different breeds age at different rates, it’s a good idea to speak to your vet as and when to transition them to a fully fledged adult diet. When it comes to training your puppy, remember that treats should be given in moderation. There are other training methods that you might want to explore including clicker training or booking classes with a behaviourist specialist. The best alternative for treats as a reward during puppy and dog training is positive reinforcement – recent research has shown that praise and affection stimulate dog’s brains just as strongly as a yummy treat, so why not save a few calories and mix up treat giving with showering your puppy with praise when they’ve learned a new skill. What type of food should I feed my dog? Every dog is different; some prefer dry food, some prefer wet. There are benefits to both, and it’s worth trialling different types of food to see which your dog prefers. Try not to chop and change too much or too quickly, as we’ve already mentioned. Consistency is important to maintain a happy, healthy dog. Dry kibble can be great in aiding the removal some of the plaque and tartar from their teeth. (Check out our tips on keeping your dog’s teeth clean and healthy.) It also helps to strengthen a dog’s jaw muscles. Dry food also tends to be less expensive than wet food. Wet food contains fewer preservatives than dry food – this also means that once opened, it won’t last as long. Most wet food contains more nutrients and protein. Wet food also contains water, so if your dog isn’t a big drinker, this might be a better option for them to help keep your dog hydrated. Wet food isn’t a replacement for water, though – your dog will still need to drink water to help regulate their body temperature and stay hydrated. Dehydrated dog food is often the same tasty ingredients found in wet food, but, as the name suggests, it’s been dehydrated – a process that cooks the food and removes the moisture. It’s a brilliant way of keeping all the nutritional value in the food. In terms of preparation, all you need to do is add warm water to rehydrate and serve to your dog. It’s important to make sure there are no hot spots which could burn your dog’s mouth. Whatever you decide to feed your dog, aim to feed them good quality, healthy and nutritionally balanced food – you can find nutritional information for many different brands and diets online, and if you are unsure, you can check with your vet, they’ll be able to point you in the right direction. poor quality foods can cause digestive problems. It is best to choose pure and wholesome brands. You can find some great examples of dog food brands on our advice pages. If you change your dog’s diet, either in type or brand, make sure to introduce the new food gradually. Switching it too hastily can create digestive problems and can be confusing for your dog. Start by mixing a little of the new food with their usual brand, and gradually increase the amount of new food each day, whilst reducing the old. The whole transition should take 7-10 days. Can I feed my dog ‘human food’? Human meals, including scraps and leftover dinner, won’t provide your dog with all of the nutrition they need. Most dog foods have been specially formulated to provide a healthy diet, including the proteins, fats and vitamins that dogs need to stay strong and healthy. Dog food might not look too appealing to us humans, and it’s easy to feel a bit sorry for our dogs when we tuck into a delicious dinner. But not all tasty human foods are safe for our dogs, in fact, some are poisonous and should be avoided altogether. What kind of food does your dog prefer? Is your dog a grazer or a gobbler when it comes to mealtimes? 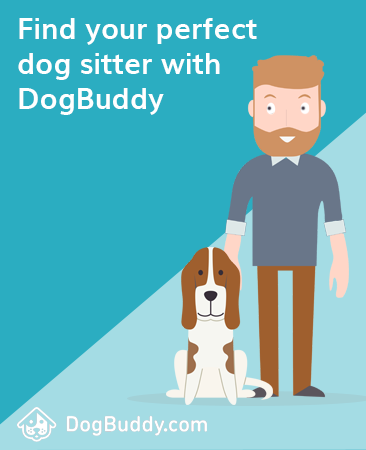 Share your story in the comments below or on Facebook, Twitter or Instagram – remember to tag us @DogBuddyCo. Hi Richard, thank you for your feedback and sorry to hear this article wasn’t up to your expectations. As we point out at the beginning of the article, the advice had been written by a vet. If you have any tips or tricks from your experience of caring for dogs, of course we’d love to hear those, too. Lazy article. You should do a lot better rather than feed people this diet of regurgitated bland doggy journalism.